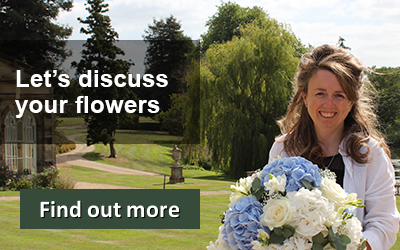 Gemma and Oliver had a very clear idea of the type of wedding flowers they wanted for their wedding at Hampton Manor. Flowers had to be the main focus, they didn’t mind a little background foliage but they made it quite clear that they liked arrangements packed with flowers. Delicate soft pastel colours were also the order of the day. 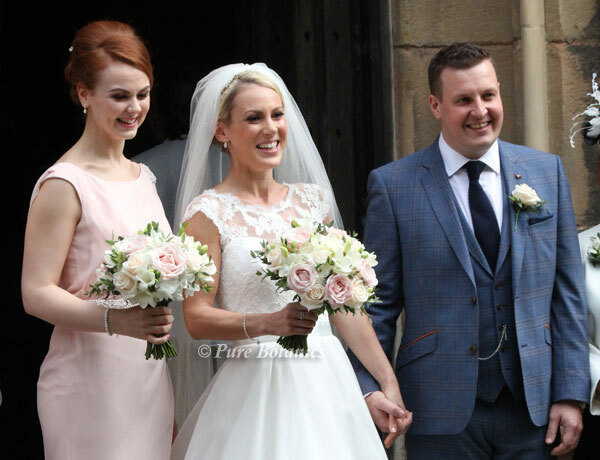 Gemma’s sister was her bridesmaid and wore a very pale blush pink dress, this became the focus of the main flower colour teamed with cream and ivory. The Groom and gents had cream rose buttonholes and Oliver had expressed that he didn’t want too much foliage. So we made sure that all of the roses were backed with just a small amount of parvi eucalyptus. I think you’ll agree that they all look stunning photographed here as they came out of the local church in Solihull. I was so pleased to be able to take these photos here. 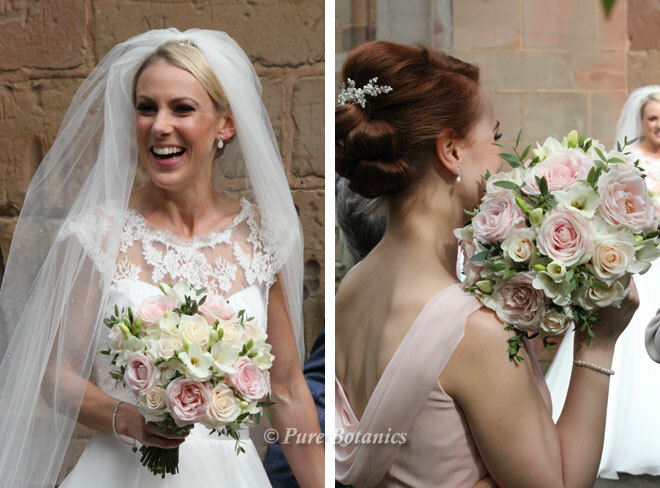 Theses two ladies held their bouquets perfectly and I was spoilt for choice on images. 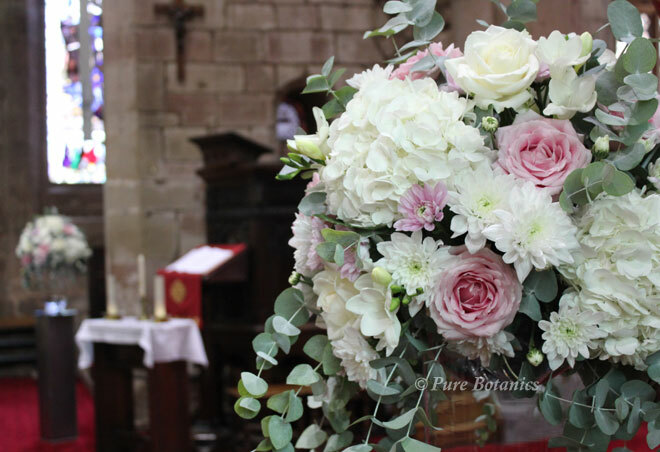 For the bridal bouquets I combined the very popular blush pink ‘Sweet Avalanche’ roses, cream ‘Vendela’ roses with ivory freesias and hydrangeas. Delicate pieces of soft sage green eucalyptus featured throughout their posy bouquets. 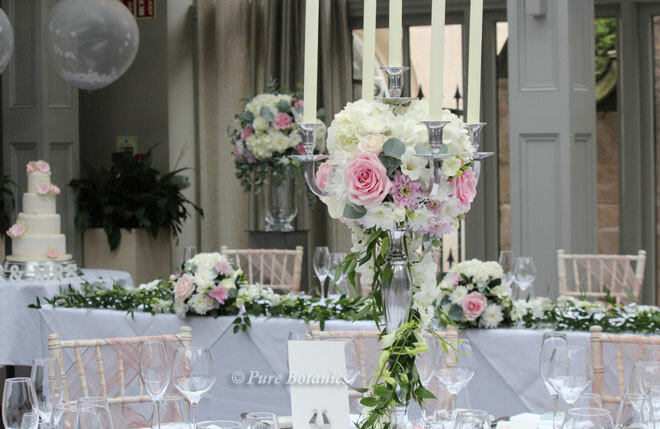 The full luxurious flower look was carried through to the wedding centrepieces at Hampton Manor. 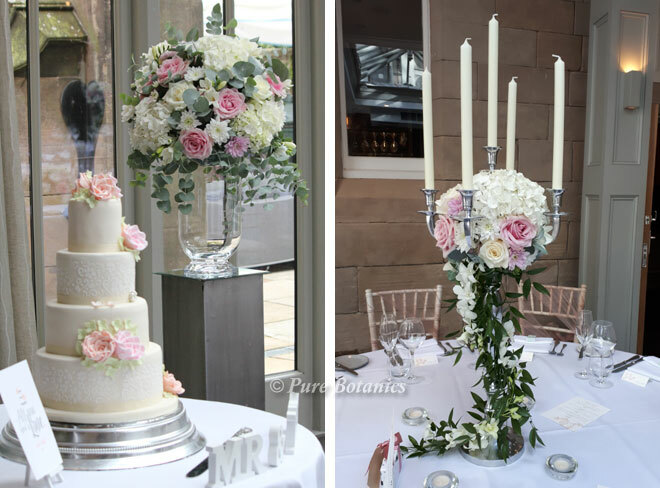 The couple chose our tall sliver candelabras and I decorated them with a full round display then draped and spiralled Singapore orchids all the way around the stem on the candelabra. This was an idea that the couple had seen and asked me to create. I think it works wonderfully well. 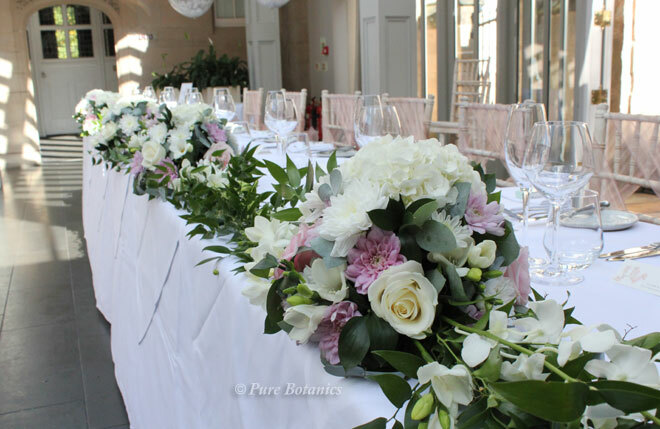 Gemma had her heart set on a garland for the top table, as the table was quite a long one we decided to create flower clusters that were linked with the trailing foliage and Singapore orchids as used on the table centrepieces. I also incorporated tea lights in glass holders into the arrangement to echo the candle theme. At the consultation we discussed an idea of having the pedestal arrangement with glass vases. This fitted with Gemma’s vision and contemporary look for the flowers. Having seen an image she liked I set about recreating it to produce the arrangements you can see here. They were set up at the church for the wedding ceremony, we then moved them to the venue after the ceremony, before the guests arrived. 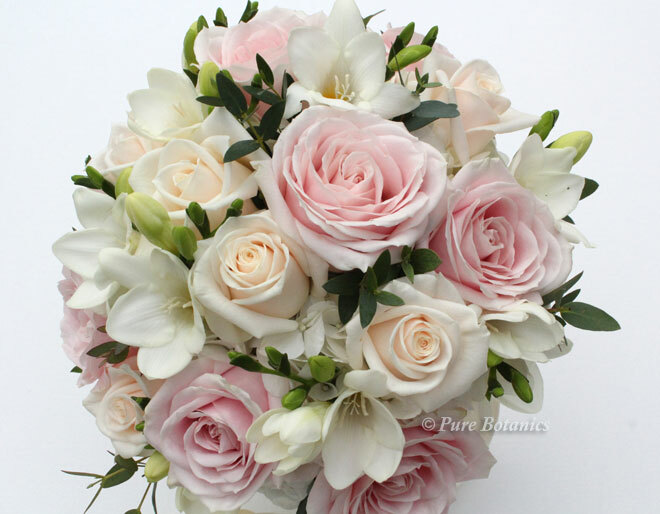 We often recommend this, as it’s such a shame not to use the arrangements as much as possible as they are so beautiful. 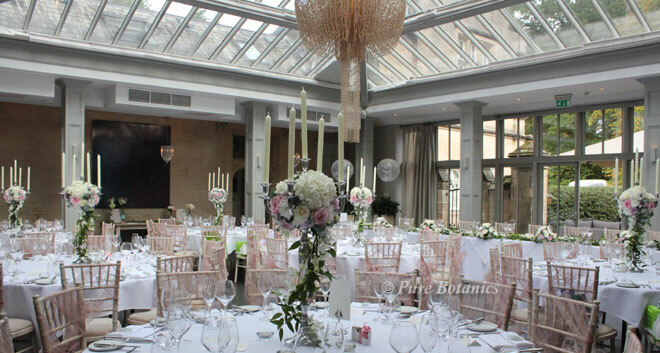 I was absolutely delighted with the overall effect the wedding flower decorations had on the room at Hampton Manor. 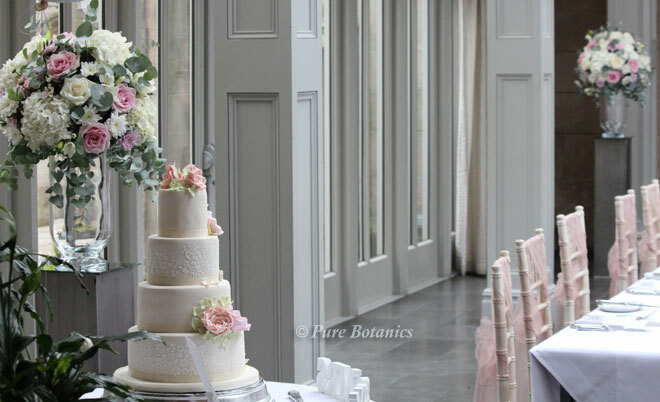 It looked really stunning and the blush colour theme worked wonderfully. 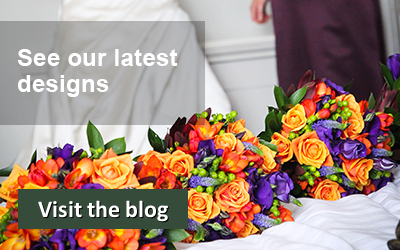 It was a lovely wedding to work on and I really enjoyed the challenge of creating and designing some new arrangements based on Gemma and Oliver’s ideas.